What is the meaning of the blue PCIe slot on the Dell T7910 motherboard when the others are black? What is the meaning of the blue PCIe slot on the Dell 7910 motherboard when the others are black? We notice that all the pictures on the web show the Gfx card plugged into the blue slot when there are other PCIe 3.0 x 16 slots on the board. Does this slot have dedicated lanes while the other slots have shared lanes? What does the blue signify? RE: What is the meaning of the blue PCIe slot on the Dell T7910 motherboard when the others are black? There are two full PCIe X16 slots. The blue is the primary one - for a single video card. If you have two video cards, the second one goes into the PCIe slot two away from the primary. The other two PCIe X16 slots are X4 capped. What does "the primary one" mean? Does it mean you get dedicated guaranteed 16 lanes from the blue slot? Are they guaranteed because they are connected directly to the PCIe root complex? Would16 lanes connected to the root complex be guaranteed to not ever be shared or reallocated? Does that then mean that the "non primary" black PCIe slot is wired down stream of a PCIe switch? 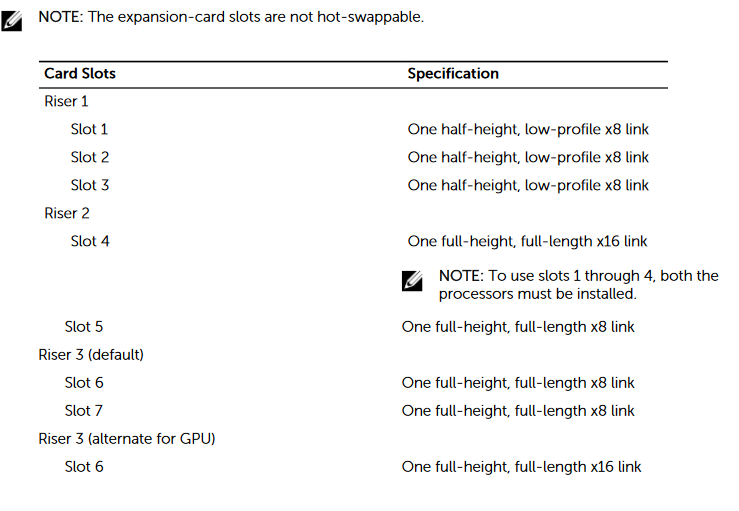 Is the black "non primary" PCIe slot guaranteed to stay at x16 no matter what other cards are plugged into other slots? PCIe spec incorrect in the T7910 user guide? How can the 3.0 x4 electrical and 2.0 x4 electrical be running at the max throughput of the 3.0 true x16? 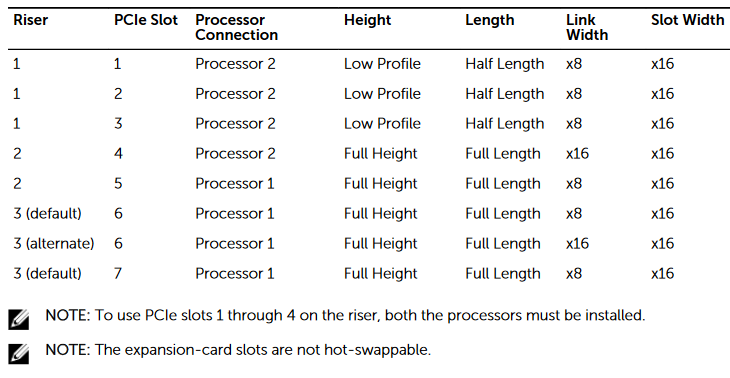 RE: PCIe spec incorrect in the T7910 user guide? X16 slots are wired X4. You do not get 100 percent X16 bandwidth on all slots. This is not an SLI nor Crossfire motherboard or a super computer allowing compute nodes XEON PHI. You DO NOT GET full X16 SPEED ON ALL SLOTS. The Black Slots are PCI Express x16 (wired as x4) connector and the Blue Slot is PCI Express x16 card connector primary Video Slot. Thanks for the post. I'm a little confused because this info looks different than what I see in the user guide. For a single CPU system with 40 PCIe lanes the user guide shows a blue slot that is mechanical x16 and electrical x16 and also shows a black slot which is again mechanical x16 and electrical x16. Slot 2 is shown to be blue. It shows it as PCIe 3.0 x16. Dell support says this is x16 mechanical and electrical. Slot 4 is shown to be black. It shows it as PCIe 3.0 x16. Dell support says this is x16 mechanical and electrical. At the same time they say blue is for primary GFx card. They say black is for secondary GFx card. The system is configurable directly from Dell with two double wide NVIDIA Quadro cards. I'm looking for why if both slots run x16 mechanical and electrical are the slots differentiated by color. If they are both the same, why designate one as primary and make the slot blue. I'm suspicious that one is wired directly to the CPU via the root complex and one is wired to the C600. 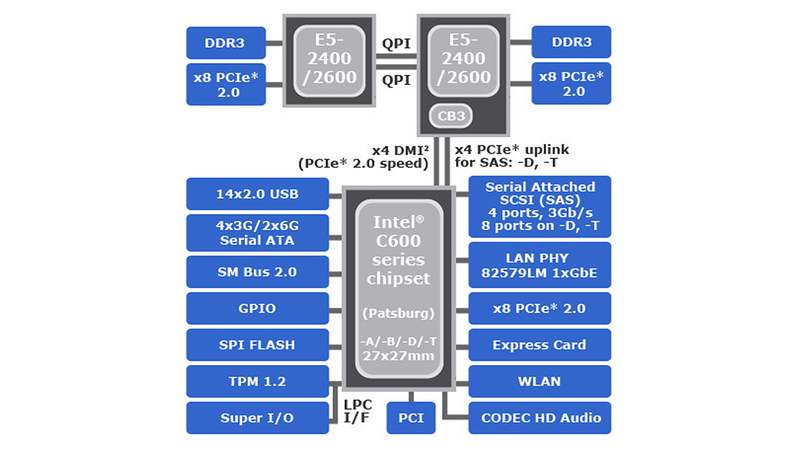 I agree with the posted PCIe chart. But if you look at the user guide it shows all the slots, whether x1, x4, x8, or x16 running at 16GB/s. I think this is an error in the user guide.